This article provides a little peek at one of the well attended sessions at the 2011 Vancouver Island Children’s Book Festival. Bookfest is an event that is organized by a dedicated group of volunteers for the families of Nanaimo and the surrounding area. Authors and illustrators gather to speak directly to children about writing, illustrating and making books in a day-long event held in May each year. This festival celebrated its 25th anniversary on Saturday, May 7, 2011. I am going to start by telling you something that you already know. You just don’t know that you know. What you already know is that once, a long time ago, I was a child just like you. So off we go into a fun filled hour packed with stories, drawing demonstrations, and a look at the illustrative techniques used by Eugenie in her books. She often uses plasticine and a wide variety of found objects to create the pictures in the books for which she is famous. She quickly teaches the audience some of her little tricks with the plasticine and provides each child with a printed recipe for home made modeling clay and step by step instructions for creating an imaginative creature. 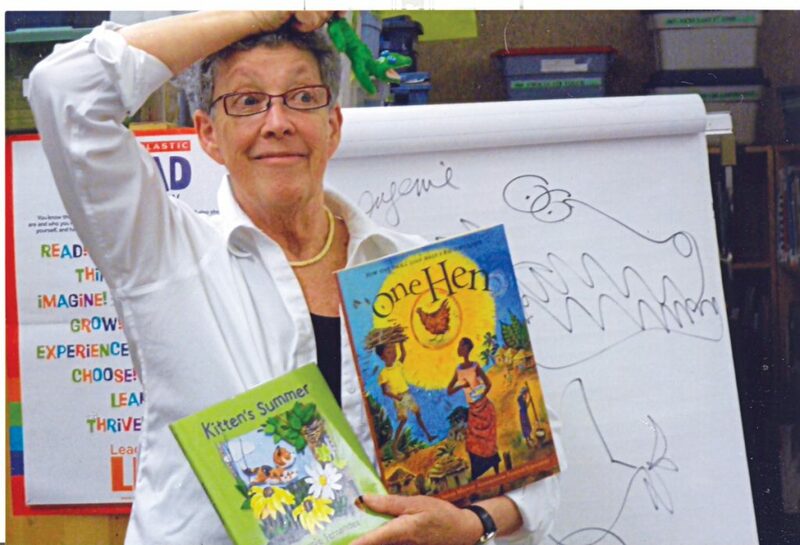 Canadian author and illustrator, Eugenie Fernandes, speaking at the 2011 Vancouver Island Children’s Book Festival. Eugenie is visiting us from Peterborough, Ontario. Her home studio is set in a wooded area which provides her with lots of opportunity to observe birds and other small creatures that live there. She tells her audience that, as a child, she loved to explore outdoors and often recorded her adventures in her own little books. As an adult she has continued to combine this interest in nature with bookmaking. She now has an impressive list of titles, many of which are found in classrooms and libraries right across the country. In September 2011, Eugenie published the fourth in her series of little kitten books. 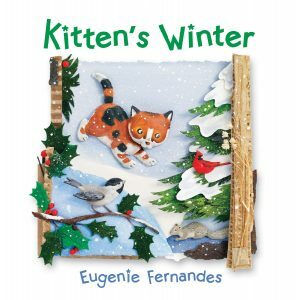 Kitten’s Winter is written in simple rhyming text and tells the story of the kitten’s struggle to reach home on a stormy winter’s day. As kitten hurries and scurries through the blizzard we are treated to a glimpse of the wild creatures living in the fields and woodlands surrounding the farmhouse. After sharing the story with her audience Eugenie delighted the children by producing one of the original pieces of artwork used to illustrate the story. The Nanaimo Children’s Literature Roundtable was formed for the sole purpose of presenting Canadian children’s authors and illustrators to local children. The first year the event was organized by a group of teachers, booksellers and librarians. The second year Malaspina College (now Vancouver Island University) became a sponsor and provided an on-campus site for the festival which was held on the first Saturday in May. Face painting, bubble blowing, bookmark making and musical acts were some of the events offered over the lunch time. Hundreds of children lined up for the book signing at the end of the day’s sessions. A scholarship program was set up for children who do not have the money to attend the event. The tickets were distributed through the school district. Committees were formed to take care of fund raising (for the cost of the reading fees and travel expenses of the authors, as well as the noon hour entertainment). The authors were billeted and fed in the homes of the volunteers. An online Art Auction was established as a fundraiser. The art pieces were donated by the book illustrators presenting at the event. A committee was formed to book authors into schools for readings before and after the festival. Authors and illustrators often stay on for a week or two after the festival to visit local schools and libraries. This means that in addition to the 500 to 1,000 people who attend Bookfest, another 6,000 to 9,500 children hear the authors in their schools or public libraries. During the 25 years of the festival’s history, over 150,000 children have had the opportunity to listen to a Canadian author or illustrator. Transportation of the authors to the schools was provided by volunteers. The Vancouver Island Regional Library offered a Mother Goose program for parents, babies and toddlers during the day of the festival. The 25th anniversary celebration was held. The reading sessions and activities were moved from the university campus to venues throughout the downtown area. Visit www.bookfest.ca for information about this year’s Bookfest. Festival tickets are sold online through the local theatre box office. The cost is $10 for each 5 to 12 year old child (accompanied by an adult; the adults’ admission is free) and $25 for a family of three or more. The children are able to attend three sessions and make their choices from a list of nine authors and illustrators at the time of purchasing the tickets. A map of the reading locations is issued with the tickets. A wine and cheese event is held on the Friday evening at a downtown art gallery to give the authors and illustrators a chance to gather and visit. All the venues are set up for the readings. Free activities are offered in the library for pre-schoolers too young to attend the Bookfest sessions (puppet shows and Mother Goose Rhyme-Time). The registered children attend (with an adult) three 45 minute sessions. The presenters use a variety of presentation techniques including story telling, readings, technology, demonstrations and singing. During the lunch break, entertainment is offered in the open plaza next to the library. Many families bring picnic lunches or eat in nearby restaurants. Books and festival t-shirts are on sale throughout the festival day. An autograph session is held after the last reading session. A celebration dinner is held after the festival. The presenters, organizers and volunteers are included in this event. This year it was held in the museum amongst the many wonderful historical displays!